I’m pretty sure I bought a car yesterday. I chose to relocate to Austin, Texas for many reasons, including the fact that I thought it might be a more walkable city than Houston, where my parents reside. Having lived in European cities for the past 26 years, I have gotten used to walking, even as a means of transportation. Putting one foot in front of the other has gotten me to work, to friends’ houses, to restaurants, to cinemas and, sometimes, from one part of a forest to another simply for pleasure. For the past two weeks, I have been driving a rental car, an SUV. It is big. It is really big. And I kind of like it. I like the height of the SUV: it has the advantage of allowing me to see what is happening ahead of me on the crazy Texas highways. It also has the disadvantage of allowing me to see what is happening ahead of me on the crazy Texas highways. Although I have owned a car since I began to drive at age 16, I have not driven much these past years (ref. the paragraph about walking above). When I sold my 1994 Saab 900S to my neighbor in Oslo, it had only been driven 218,000 kilometers (135,000 miles)…that’s about 9,500 km (6,000 miles) per year. And, since I have not driven much these past years, I had forgotten some of the few but significant pleasures of driving on highways in the US. On a recent drive from Austin to Houston for Thanksgiving, nearby motorists might have noticed me careening along at the speed limit of 75 mph (120 kph), singing along with the powerful vocals of Robert Plant to Stairway to Heaven blaring through the bluetooth speakers in my big SUV. It was as if Robert himself was sitting next to me, and I liked it and I’m pretty sure he did too. Now, rather than looking for a long-range electric or hybrid car, I have decided upon a somewhat sensible compact SUV with excellent safety features (airbags all over the place) and a quiet ride; this, to ensure that my duets with Robert are not dulled by highway noise and that we both enjoy a comfortable and safe ride together. I have cried twice these past two weeks since I moved back to the US: the first time was when I found out that I would not be able to get a bank loan to buy a place to live because I do not have a job after the end of the year, and a second time when I found out I have to establish residency in Texas before I can get a Texas driver’s license and that it takes a year to become a resident of Texas. Other than that, my reintegration has been a breeze. Having lived outside of the US for 26 years now, I seem to have forgotten how to live in the US. I am American, born in Dallas, Texas (doesn’t get more American than that…except perhaps if I had personally sailed in from England on the Mayflower in 1620). I like root beer and Twizzlers. I grew up watching My Three Sons and The Brady Bunch. I have a social security number, the equivalent of a European national identity number…all things that define “American”. But I don’t have a credit rating and, without, that, I might as well be from another planet, such as Europe. I don’t know how to purchase real estate or how to buy a car here. I don’t know which laundry detergent is best or what to wear when it is 60 degrees outside (seems hot, but it isn’t). I forget that when an ironing board is priced at $17.97 I really have to pay $19.09 after the sales tax has been added. I forgot how annoying it is to have to figure out how much to tip a server in a restaurant because they are not paid a decent wage at the outset. But I have also forgotten how nice people can be here. When turning the corner in a supermarket aisle, the person doing the same thing from the other side apologized profusely…for being there… for being in my way…for being. Compared to Norway, where people never excuse themselves for fear of intruding in another person’s space, or France where people get angry because you are in their space and it is their space and why are you in it in the first place?, I find this surprisingly pleasant. I went to the Yeti flagship store in Austin to buy one of their famous tumblers and the guy at the checkout asked me “So, what did you do today?” and, when I answered, it actually turned into a conversation…and the conversation was interesting. I liked that. I do not know many people in Austin yet. I like eating at restaurants. This means that I eat alone at restaurants. The average restaurant in the US caters to families, couples, people eating alone, polar bears, aardvarks…in fact, they cater to just about anyone (at least since the passage of the 1964 Civil Rights Act that made segregation in public places such as restaurants and lunch counters illegal). It is easy to eat a very good meal for a very reasonable price, alone and comfortably. I can highly recommend the tamale cakes at The Shady Grove. 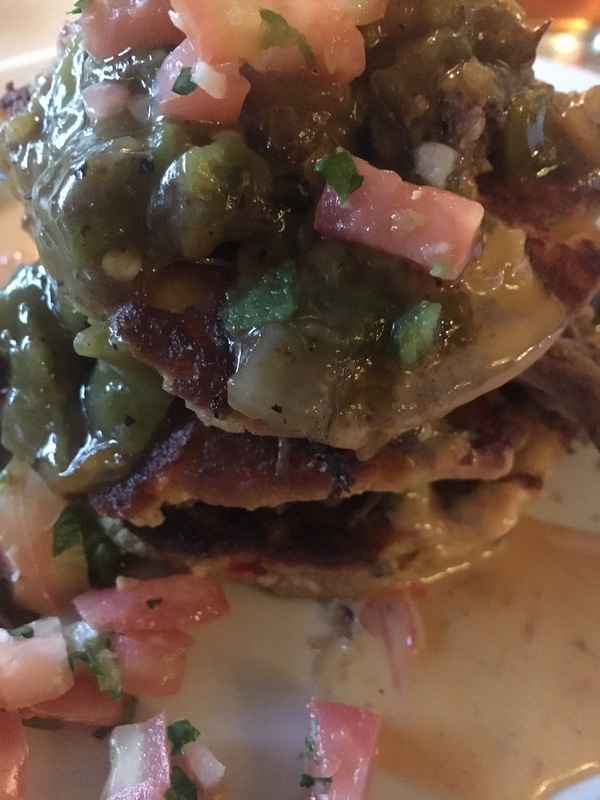 Tamale cakes are an amazing combination of fried masa, pulled pork, queso, green chili sauce and pico de gallo (all staples of Tex-Mex cuisine). I’m sure the tamale cakes taste just fine when dining with others but I think they must be even even more delicious when dining alone…especially when washed down with a Houston-brewed Weisse Versa beer (how could I possibly resist ordering that?). The tamale cakes and the beer came to $17.00 (NOK 140)…plus tax…plus tip. Me…and Tromsø (pronounced “Troomsuh”). This is where Hans Einar and I spent the weekend from 3-5 January 2014. 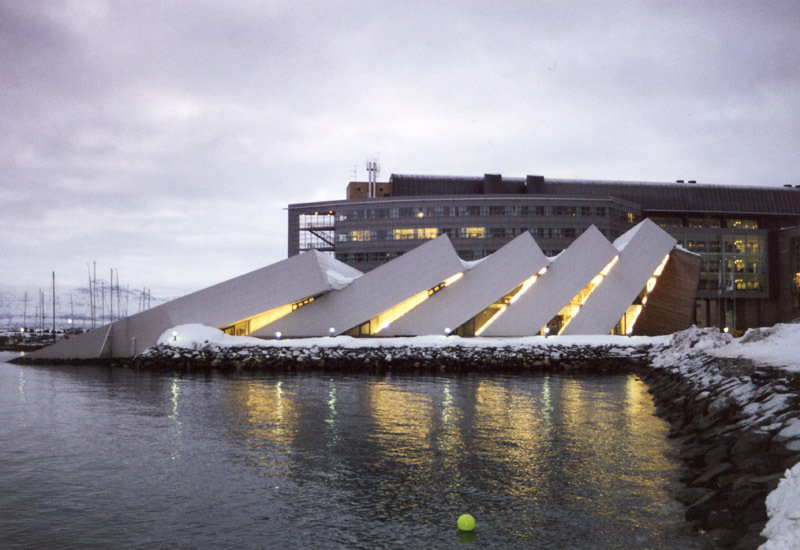 Tromsø is a group of islands located here, 350 km north of the Arctic Circle. 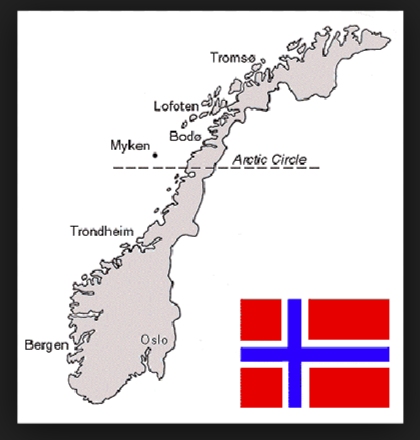 I live south of Oslo, about 1,200 km south of the Arctic Circle. 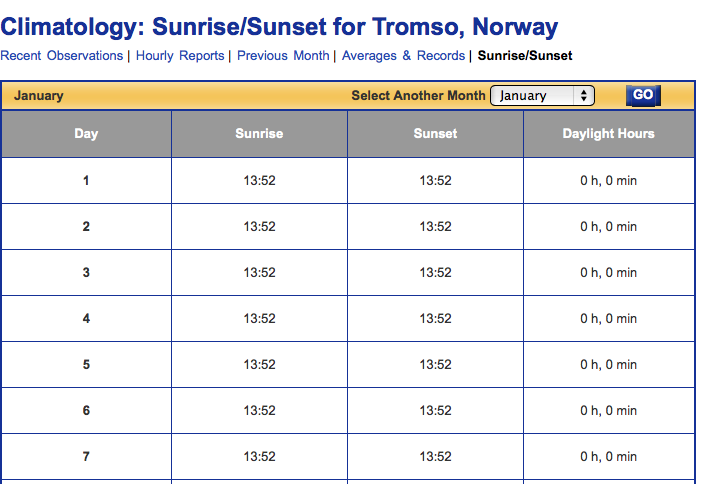 So Tromsø is far away. I did not go to Tromsø to see the northern lights, although I had hoped I would catch a glimpse of them. 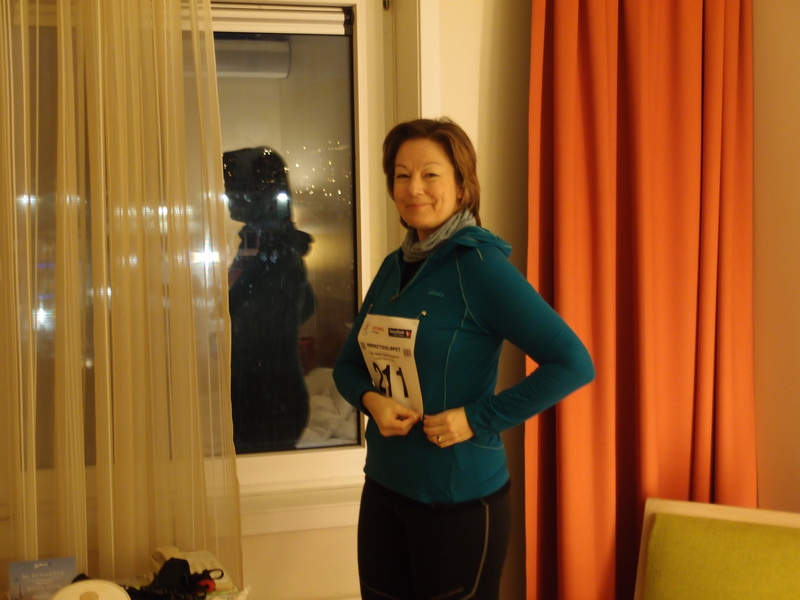 No, I went to Tromsø to run a half-marathon…in the dark…on snow and ice. 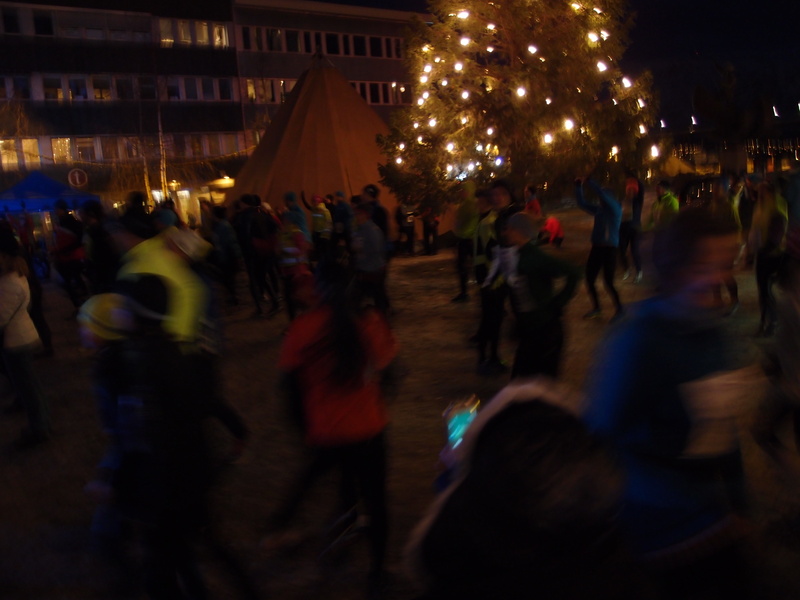 The Polar Night Half-Marathon is in its 11th year of operation. In addition to the 21k run, there are 10k and 5k runs (for the wimps!). This year, 1,117 brave souls were, like me, inspired to run in this exotic destination. I know, Hawaii is also exotic (and warm and sunny), but that is for another time. As with the three other half-marathons I have run, Hans Einar accompanied me to show his support. This he does well, especially on race day when I am jittery and I wonder if there is something wrong with me and he reminds me that I get this way each and every time I run a race. He is also one of the last ones waiting at the finish line to see me cross over after most of the runners have completed the race and are already having a beer to celebrate. And, he yells out “heia, heia” with as much enthusiasm and pride as if I were first over the finish line and, because of him, I feel as if I am. 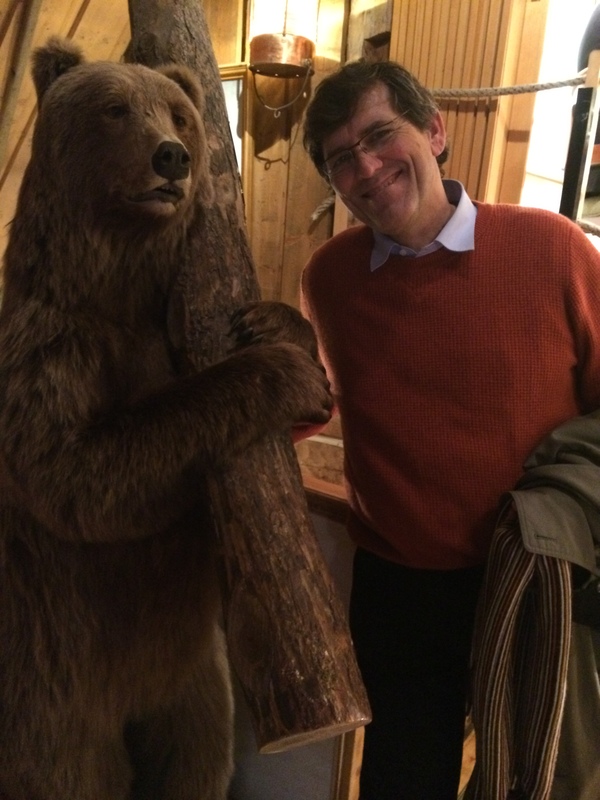 Hans Einar and a polar bear at the Polar Museum. The day before the race, we did a bit of tourism, visiting the very interesting Polar Museum that traced the polar expeditions of Roald Amundsen and Fridtjof Nanson. We also visited “the world’s most northern aquarium”, the architecturally exquisite Polaria, where we stood for a long time watching two adorable bearded seals pop out of their open arctic aquarium to display themselves for us (there was no one else around so we had them to ourselves). Polaria – photo taken in a month with light! Getting ready at the hotel. With woollen underwear, my favourite running jacket, my iPhone with a John Grisham audiobook queued up, plenty of energy gels and spikes on my shoes, I set off to join the other runners for a 15-minute warm-up provided by one of the local gym chains. As Hans Einar and I approached the start area, I heard the end of O Fortuna from Carmina Burana blasting from the loudspeakers and felt a rush of adrenaline. I wonder if Carl Orff had Halbmarathon-Läufer in mind when he wrote his musical composition. It did the trick for me! 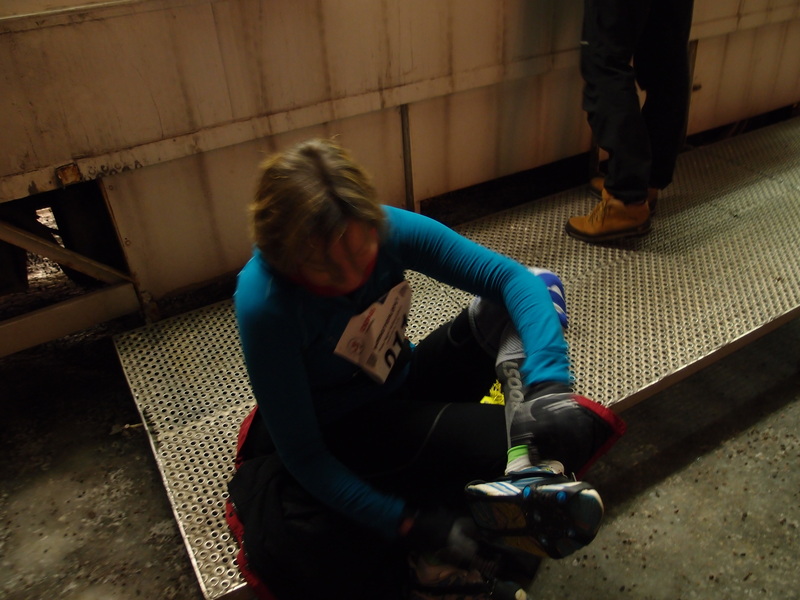 Pre-race ambiance…yes, the photos are dark but so was everything! At 14:59 the countdown began, we runners lined up behind the start line and, “five, four three, two one”, we were off, through the centre of Tromsø along streets lined with well-wishers (northern Norwegians are known for being particularly hospitable). In no time, we were out of town and on our way to the airport and the 10.5k turnaround. The entire route was lit by candles and there was a strong contingent of race volunteers who made me feel VERY important since they stopped traffic just so I could cross the road (well, I guess they did it for all the runners but I pretended they did it just for me). As with all my running, I use Jeff Galloway’s interval method of walk-run and I had set my handy interval timer to a 40:30 ratio (40 seconds of running followed by 30 seconds of walking). This method has really worked for me so there was no question that I would use it in Tromsø. Jeff is an American marathon runner (he participated in the 1972 Munich Olympics) and his walk-run method is very popular in the US. But I have yet to find another runner in any of the half-marathons I have run who uses an interval timer. The timer vibrates and beeps when it is time to switch intervals. I have often felt embarrassed by the beeps and the stops and starts, as I pass others on my run interval only to have them pass me on my walk interval. In the end, I usually end up leaving behind 5 or 6 of those runners since they run out of steam before I do, thanks to the walk breaks. I have gotten used to the beeps and the embarrassment but I am still acutely aware that my beeper noises and starts and stops may annoy some runners. Around the 3k mark, I had stopped to adjust my spikes and was aware of a presence behind me that had also stopped. I turned around to see a couple who had, in fact, stopped behind me. Kristie said “we’re stealing your intervals” in a very American English and I responded “you’re very welcome to them!” and we proceeded to run the rest of the race together. Kristie and Ricardo had flown in from Seattle for this race and are both devout followers of Jeff’s walk-run method. Kristie’s timer had frozen at the start of the race (pun not intended) and when I had passed them on my run interval, Kristie had recognised the timer beep and they proceeded to discreetly follow my intervals, staying behind me so as not to reveal themselves. But when I had stopped, Kristie decided to tell me what they were doing. From that point on, we ran together, talking a bit, stopping once or twice to take photos and, in general enjoying ourselves despite the physical challenges of running on ice in the dark for 21k. Around the 15k mark, we ran up to another participant who was walking and eating a banana. I said “hello” to him and mentioned what a great idea it was to have brought along a banana. Jet (a local resident originally from the Philippines) told us that he had not brought bananas with him. He had, in fact, run out of steam and had stopped in at a grocery store (one of only a few along the way) to get a banana to boost his energy. Having no money, he had asked the grocer if he could have a banana with a promise to return and pay later. The grocer gave him two bananas. Ricardo offered him an energy gel which he gratefully took and Kristie, Ricardo and I resumed our intervals. This was the first time I had actually run with anyone, since running has been a cherished solitary activity for me. But I must admit that I enjoyed this run so much more thanks to Kristie and Ricardo. We pushed each other, kept up a good pace and crossed the finish line together, with our arms raised in triumph. I’ll save the Grisham audiobook for another time. We met Jet again at the race end. He came in slightly ahead of us so the bananas and Ricardo’s energy gel had helped. 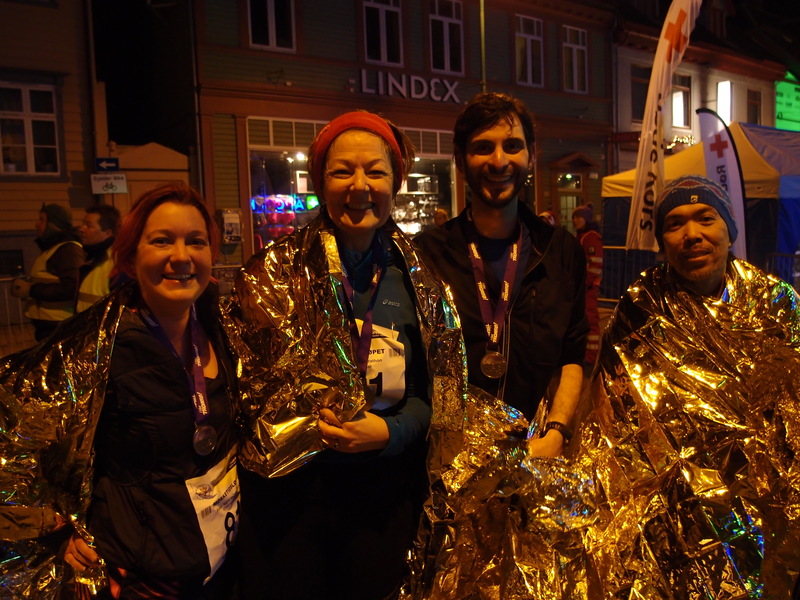 Hans Einar took this photo of us, blissfully exhausted and so very proud. Now, about that Rwandan restaurant. As with any trip, I spend time researching the destination and especially its culinary possibilities. 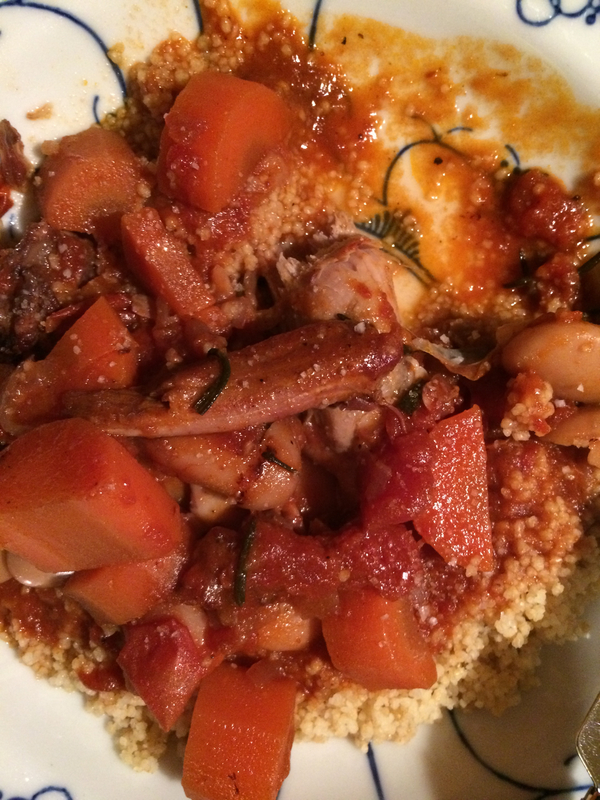 I had discovered an unusual option for Tromsø on TripAdvisor; an African restaurant that had many positive reviews. In keeping with my theme of the exotic, Hans Einar and I celebrated my victory with dinner at Afrika Oase. Rose, the owner, is from Rwanda. She explained to us that she was living in Luxembourg when she was offered a grant by the Norwegian government’s “innovation group” to move to Tromsø and open an African restaurant. Norway is trying hard to internationalise and Tromsø has a large university full of international students and faculty who need to be fed. Rose imports most of her products directly from Africa but has had also struck a deal with a few nearby farmers to raise goats for meat for her restaurant (instead of just for the brown goat cheese so cherished by Norwegians). We ate near an open fireplace (which Hans Einar stoked every now and then since he is a master fire-builder). I spoke French with Rose and told her about my trips to Rwanda and we discussed a bit of politics (but not too much). We had an absolutely delicious meal of marinated goat kebabs and antelope, one of which was served with a blueberry chutney and the other with a red onion and chili chutney, friend plantains and a melon and cabbage salad. Rose gave us a taste of every single juice on the menu (I especially enjoyed the ginger and hibiscus juices, Hans Einar loved the mango and baobab juices). Hans Einar washed his goat kebabs down with a German white beer and I chased down my antelope (pun intended!) with a glass of red wine from Fairview, a South African winery I had visited back in 2001. It was a wonderful way to revive my tired body. 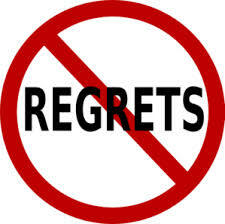 Because I train quite regularly, I don’t get really sore after running. I have some small aches and pains but nothing dramatic. 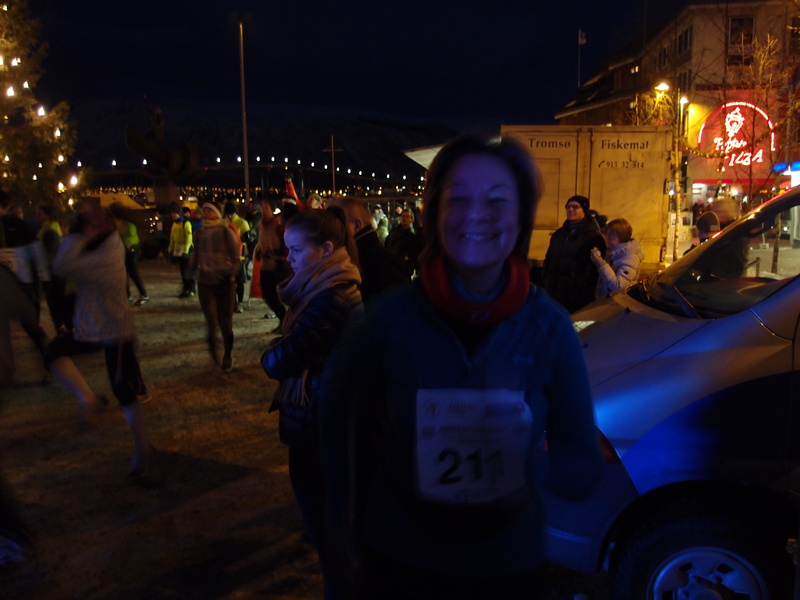 Tromsø’s Polar Night Half-Marathon did a number on my feet though and I spent a few hours in the middle of the night massaging them. While I enjoyed the race, my feet did not have such a good time. Hans Einar and I roughly calculated the number of times my feet would have struck the hard ice…we ended up at around 39,600 strikes…OUCH! 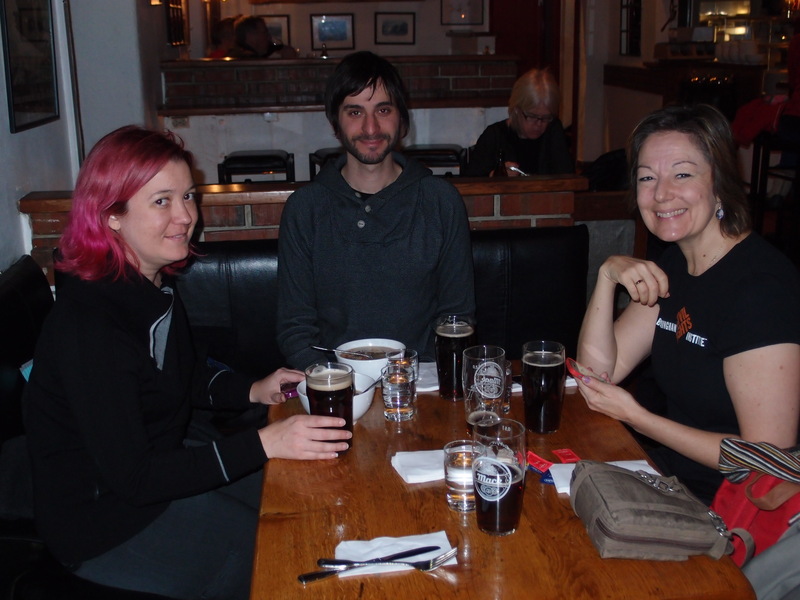 We met up with Kristie and Ricardo the next day for a celebratory lunch that included a few of the local Mack dark beers from “the world’s northernmost brewery”. I really liked Kristie and Ricardo and hope to maintain some contact. Who knows, I may run into/behind/in front of them at another race in some other (warmer?) exotic destination. 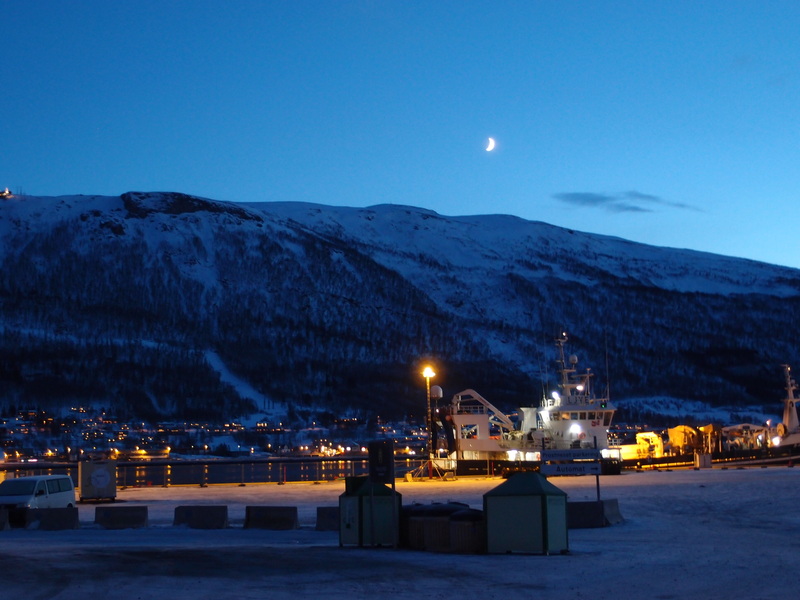 Tromsø is a dramatically beautiful place and well worth a visit. The Polar Night Marathon organisers also run a Midnight Sun Marathon in Tromsø on 21 June each year…when the sun never sets. Time to start training now? 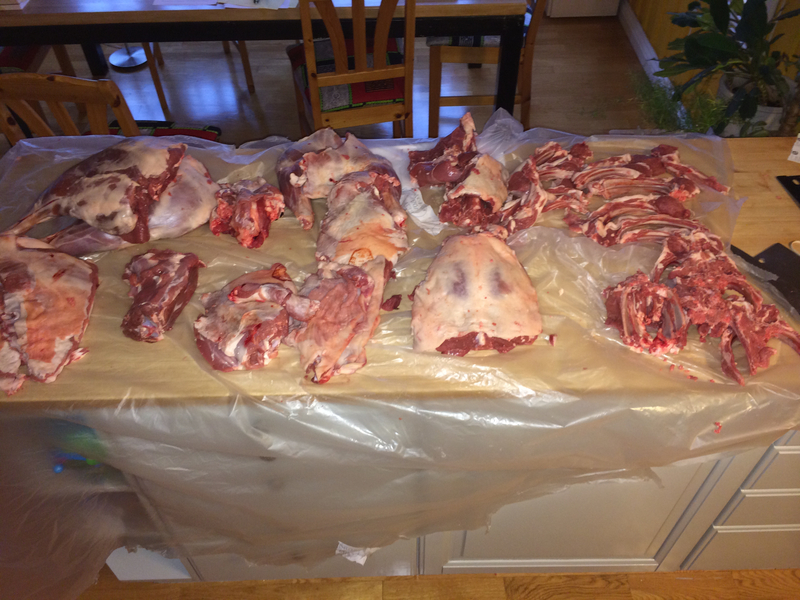 Two days ago I butchered a lamb… a whole lamb…really! 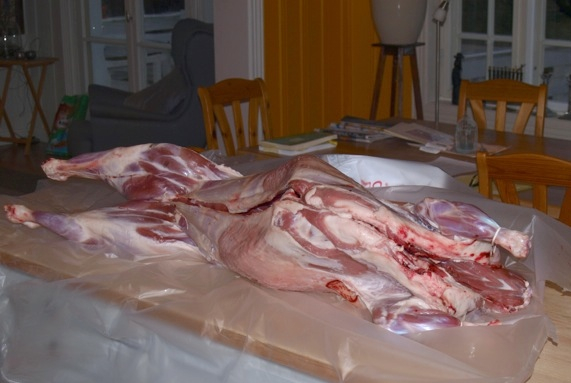 This was not just “any” lamb, it was a former neighbour of ours. 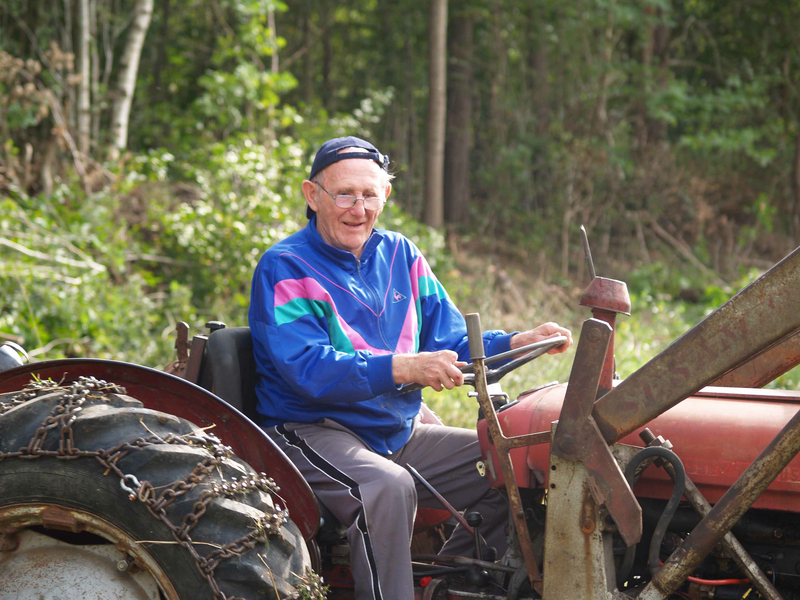 Bjørn Erik is a farmer who lives 1 km down the road (I know because I run this route often and when I arrive at his farm, my iPhone app tells me that I have completed my first kilometre). He runs an organic sheep farm and we often make a point of stopping by in May during the lambing season. Yes, the babies are very, very cute! This year, Bjørn Erik asked if he could let some of his flock graze on Hans Einar’s pastures, since Hans Einar and his brother have become organic farmers and this was the first year that the pastures were certified organic. In return for the right to graze, Hans Einar asked for a lamb. We have taken to buying more organic meat (and eating less of it) so we looked forward to a years’ worth of organic lamb. Hans Einar brought home the slaughtered lamb and two days later, while Hans Einar was busy at the college celebrating Christmas with his colleagues, I rolled up my sleeves, put on my apron and, with saw and knife in hand, set out to confront the challenge. I was squeamish about the task but figured that I really should be a more responsible cook and see close-up the source of my meals. 1 Macbook Pro with a series of YouTube videos on how to butcher a lamb queued up. I ended up with 1 kg of lamb mince, 12 lamb chops (French-cut, of course! ), 2 legs of lamb, 2 lamb shanks, 2 breasts, 1 rack of lamb, 2 lamb shoulders, 1 neck, 2 tenderloins and a bunch of bones were boiled and made 6 outside cats very happy. The process was more physically demanding than I imagined and I would have liked a better saw (maybe an electric one!) however, the most difficult part was keeping track of the various cuts so that I could label them correctly before freezing. The most surprising bit was that, during it all, I experienced genuine feelings of gratitude for the lamb that I had certainly crossed many times while it was out grazing and I was out running…my neighbour. 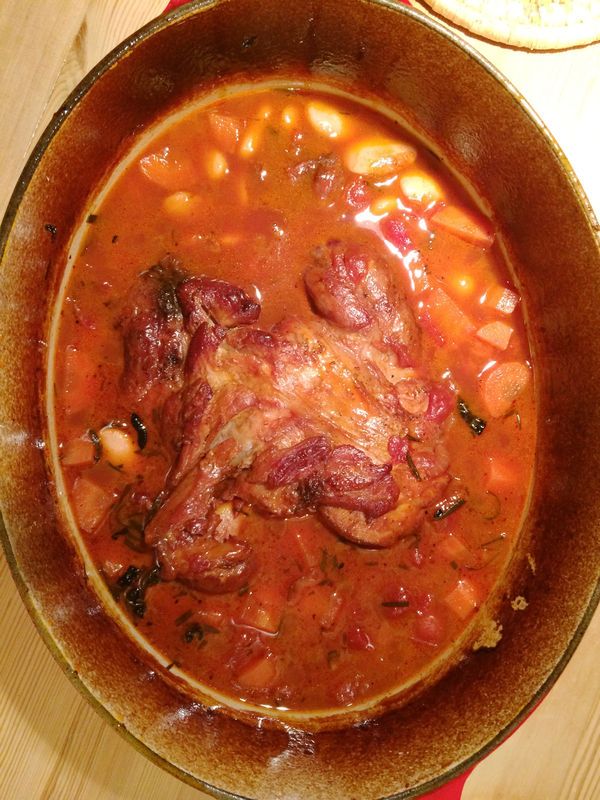 Tonight we ate our first “very local” dish, a slow-cooked lamb shank in red wine with cannellini beans. It was delicious. Happy holidays and may you all be grateful for whatever you will be enjoying at table. If you are new to my blog, you may wish to read these posts in chronological order. I have numbered all posts to facilitate this. Our last morning in Cannon Beach was spent sitting on a log on the beach, eating a bagel, drinking coffee and watching the locals take their dogs to the beach for early morning exercise. I don’t think I’ve ever seen happier dogs than those prancing around on a beach. With our return flight only a few days away, we left Cannon Beach and my giggly, girlhood memories and headed back to Seattle. We arrived back at Ellen and David’s place to another warm welcome and another great meal. At dinner we recounted our tales of Indian residential schools and bike trips along False Creek; of Caffe Mingo’s meat marinated in espresso and wine, the good karma at our apartment in Portland and our meeting with Lucille and Julian; of John Steinbeck and Charley and the redwoods; of wool spinning, Indian tribal dances and Joe’s Deli; of lazy days in Bandon and job interviews at sunrise; and of chocolate-covered sea foam and bubble-gum cigarettes, Tilt-a-Whirl’s and Haystack Rock. We obviously needed a debriefing! But lest you think that my nostalgia trip had come to an end, there was still one more meeting scheduled for our last day in Seattle. Debbie, my eldest sister Carolyn’s best friend from our days in Portland, was a constant presence in our family. In fact, it was difficult to talk about Carolyn without mentioning Debbie, they were so inextricably linked.